Like its creamier brethren, cosmetic eye gel aims to reduce puffiness, fine lines and dark circles by moisturizing and firming, using ingredients such as hyaluronic acid, vitamins, caffeine, antioxidants, collagen and fruit or vegetable extracts. As the range of purposes and ingredients suggests, eye gels vary widely by brand and label. Regardless of type, however, most steps of applying eye gel safely and effectively are universal. Wash your hands. Thoroughly coat them in soapy lather and rinse with warm or cold water for about 20 seconds. This helps prevent the spread of germs to your eyes. Likewise, it's best to apply after a pore-opening shower or after washing your face with a gentle soap and patting it dry. Apply a small dollop of eye gel to the tip of your index finger. You don't need much -- typically, a dab a little less than the size of your fingernail does the trick. Touch the tip of your index finger to the ring finger of your opposing hand, then rub together the tips of both your ring fingers to spread the gel. Using your ring fingers to apply the gel ensures a gentle touch. Standing before a mirror, open your eyes wide and look upward -- use the mirror in your periphery to help guide the application process. Gently touch the tips of your ring fingers to the soft skin under your eyes. Dab the gel from one corner of the eye to the other, staying just under the eyelash line to avoid getting any gel in your eye. 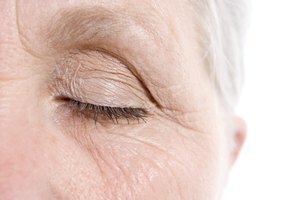 Cover the eyelids and sides of the eyes where crow's feet may occur as well, dabbing back and forth from the eyelid to the side of the eye to beneath the eye two or three times. Repeat the application process daily -- ideally each night before turning in for bed or during your morning routine -- or as recommended by your eye gel's manufacturer. 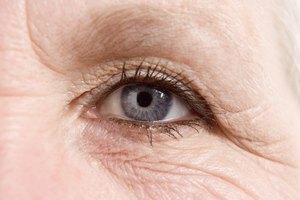 Before you start using a new eye gel, always read and follow the manufacturer's instructions and warnings. To avoid infection, never touch the eye gel tube or container to the area around your eyes -- stick to clean fingers for a safe and effective application. The Guardian: Is Eye Cream Worth It?